All trees require care to survive. They must receive the proper amount of sun, water, and nutrients, and live in a climate that they can tolerate. Any Lincoln City tree service will tell you there are a few native trees that are the first ones recommended for residential landscaping. These native varieties include Shore Pine, Sitka Spruce, Pacific Madrone, Red Alder, and Vine Maple, among others. While planting native trees is a great first step to ensure that your selection flourishes on your property, they still require specific care each season. If you have a Red Alder tree on your property, hopefully, you already know that it’s intolerant of shade and should always maintain a dominant canopy position. If you notice other nearby trees trying to encroach on your Red Alder, trim back the branches of the surrounding trees. This particular tree is also negatively affected by severe freezing and continuous frosty conditions when newly planted. If you have a young Red Alder in your yard, take steps to protect it from these conditions by covering it with burlap, sheets, or tarps before the cold sets in. 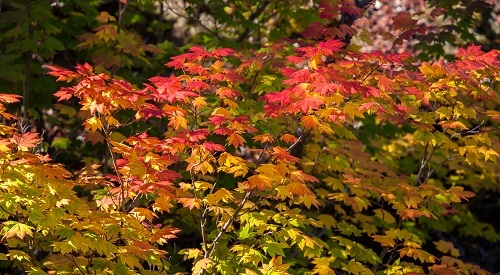 If you decided to landscape with the colorful Vine Maple, this plant will survive with little help once established, but September and October are the perfect months to collect its seeds. 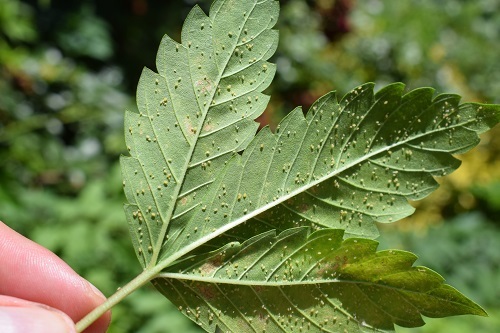 While it is more challenging to grow a Vine Maple from seedlings, if you sow the seeds immediately after collection either where you want the new plant in your yard or in a pot, and then water them sparingly in the first year, you may have success. Make sure the seeds are drying out and turning brown. This is the perfect stage before attempting to grow a new Vine Maple. If implantation is successful, this plant can be trained to stand as an erect tree reaching between 10-15 feet or may act more like a vine as it bends over once it gets too heavy before trying to reach up to the sunlight once more. You can also train it to grow along a fence or even bend its branches, much like a Bonsai. Each tree varietal has its own pruning preferences. While some trees barely need any pruning, others require regular upkeep. If you chose to plant a Sitka Spruce in your yard, you’ve selected a tree that will most likely live past 500 years old. It’s a keeper and will shower your yard with greenery for the rest of your life. However, even the Sitka Spruce may produce dead knots or become too full and require some thinning. If thinning or pruning is needed, any major pruning of this tree should take place during the fall season. Pruning is also highly recommended for the Sitka Spruce if you plan to use the tree as timber one day as this can improve the quality of the wood. If a Pacific Madrone is your tree of choice seeds can be collected between October and December, and planted in the fall, as well as the spring. Dried seeds may be stored for up to two years and should initially be planted in a container filled with peat, sand, and gravel. Once it grows at least two feet tall, then it can be replanted. If you decide to plant a Pacific Madrone, choose an area that receives little water and full sun or partial shade. Do not plant it near your lawn or other greenery that require frequent irrigation. In fact, only water via infrequent, deep irrigation during very dry summers. 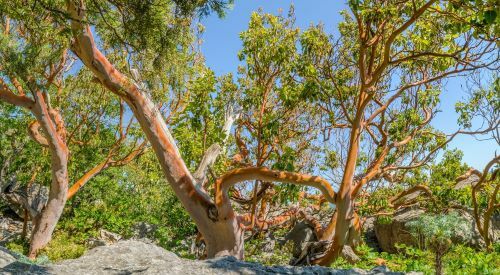 Unfortunately, the Pacific Madrone is declining. The exact cause is unknown but likely related to a combination of soil compaction, fire suppression, drought, and the introduction of new diseases. The seedlings also see a high mortality rate making it a challenge to sustain, but if you’re successful, your tree can last up to 200 years. If you’re looking to plant the only two-needle pine tree that’s native to Oregon, then the Shore Pine is your pick, however, it’s appearance will depend on the location of your home. Along the Oregon coast, Shore Pines are twisted and stunted due to the forceful wind, but inland they will grow straight and tall. Do you have a preference on its appearance? 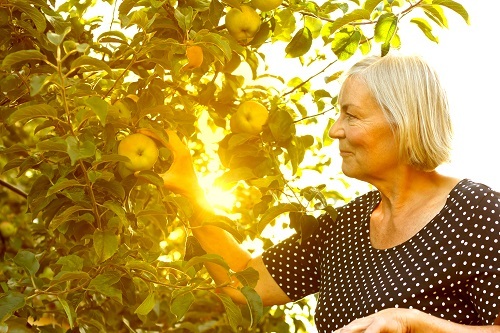 No matter how close to the water your home is located, if you reach out to your local Lincoln City tree service, they can help you train your tree to grow as desired with the use of twine and guide wires. If this is the tree for you, the fall is the perfect time for transplantation. Its roots are still growing throughout the summer, so if it’s planted on your property in the fall, it will have a stronghold come spring. Already have a Shore Pine in your yard and wondering when you can prune it down? This can take place any time of year, including fall. The most important consideration isn’t when, but how. The cut must be made immediately outside the collar. This will cause only a small wound that the pine can easily seal. Pruning the Shore Pine needs to be done properly in order to keep the tree strong and healthy. The wrong move will lead to slow wound healing, weakening the tree and exposing it to disease. For this reason, it’s best to count on a Lincoln City tree service to perform this task. If you need assistance caring for one of the more popular Lincoln City trees mentioned above or are looking for additional information on fall tree care, reach out to Vernon Imel Tree Service. We are an OSHA-approved business that is properly licensed, bonded, and insured, with certified arborists on staff. If you want your trees to look their best this fall or guidance on ways to help younglings survive through their first winter, call today for a consultation or to schedule an appointment with one of our Lincoln City tree service experts.